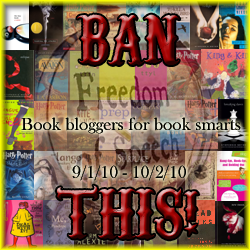 This is the second of my reviews for the Banned Book Challenge. Go to the main post on StephSuReads' site here and my post discussing the challenge here. Ellen is torn between two worlds. Her parents expect her to be obedient, get straight-A's, go to Harvard, and become a doctor. Ellen doesn't know what she wants. She wants to make her parents proud and live up to their impossibly high expectations. Yet she also wants to go to parties, do gymnastics, have a boyfriend...be a typical American teenager. This would make life hard for any teen. Ellen faces the additional pressure of growing up as the only Asian teen (other than her sister) in her small town in the Iron Range. The Iron Range of Minnesota is located in the northeast corner of the state; this rural mining area is not known for its racial diversity. Ellen's classmates and teachers frequently make little racist comments to needle her and even escalate into ugly hostility. Finding My Voice was an "okay" book. The plot was an interesting coming-of-age story, and it read quickly. But I just didn't believe a lot of it. I did believe the racial hostility. I can't imagine how difficult it must have been for the author to grow up in rural Minnesota in the 1970s and 1980s. I'm sure blatant racism was a common occurrence throughout her youth. With the exception of one incident at the end of the book which I thought was overdone, the depictions of racism seemed unfortunately realistic. My problem with the book is hard to define in one sentence. Ellen has lived in this little town her entire life. Even if she is the only Asian kid, you'd think her classmates would be used to her by now. The book reads as if the hostility is something new, and Ellen's classmates don't seem to know her very well. By the time I was a senior in high school, I knew everything about my classmates, and I went to a large school. Also, when I was a senior, most of the teasing stopped. 18-year-old kids aren't as interested in terrorizing their peers than 15-year-olds. Ellen seemed very unsure of herself for being a senior in high school. Granted, many 18-year-olds have no idea what they want to do with their lives, but most have a better sense of themselves than Ellen. 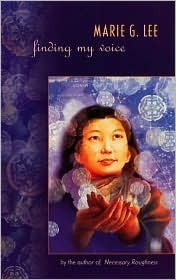 I feel like this book would be more realistic if Ellen had been in 8th or 9th grade. I read this book for the Banned Books Challenge. I can see why some people object to this book. There are numerous racial slurs, moderate swearing, and several depictions of teenage drinking. But banning the book seems pretty extreme. The most offensive part of the book is the racism. Despite its ugliness, experiencing racism alongside a character is far more education than simply reading about racism in a history book. Plus, the swearing and alcohol is minor in comparison to many YA books. Finding My Voice is an interesting depiction of a Korean-American girl trying to find her place with negative pressure coming at her from her classmates and overbearing (albeit well-meaning) parents. I don't know that I'd recommend the book to others if I could find any alternatives. The concept is good, but the execution is a little lacking. Amazing the books that get banned and as for the reasons why - I'm speechless. Good handbag is a worldwide replica handbags website. We offer more than 20 high-quality replica handbags and replica handbags brands in wholesale prices. From now on your online shopping and wholesale replica handbags here today. Professional service and quality experience in the wholesale handbag replica made in China. If you like click on the Buy Now button, you can directly through our wholesale website without having to register handbags handbags copy. Using the most advanced fast and secure payment systems such as PayPal. You can also pay your handbag by wire transfer. Buy cheap! Save money! Good handbag, will not let you down my handbag quality is one chepeast you bought! When you first try to find a quality and comfortable buying replica handbags wholesale! Louis Vuitton is a myth of women's names, the names of magical connotation, representing dream designer handbags. A mysterious name, triggering want owe a common maturity, when you say it softly: Louis Vuitton handbag ... a wealth and social identity boundaries, when you say it in a cocktail party: Louis Vuitton handbags. If a copy of the Louis Vuitton is the most popular choice for women's fashion, the huge demand for other leading brands continue to experience. Meanwhile, a good Chanel Chanel handbags handbags, replica handbags for the first time in February 1955 - hence the name 2.55. Coco Chanel handbag design their own some of the gucci replica features, tell us a little about her lifestyle and original fashion! Meanwhile, in order to satisfy every woman's taste, we offer more than 20 high-quality replica handbags and replica handbags brands, including Fendi, Chanel, Balenciaga, Hermes replica bags, Gucci, ... and many more many brands and models, in a good handbag. We specialize in high quality Chanel replica handbags. Replica Chanel handbags birthday, Valentine's Day gift is perfect. Replica handbags are not cheap imitations; they are true copies of the chanel replica original product. Wearing these louis vuitton replicaexpensive bags are famous; at work and at play Chanel make their statement. Replica handbags in the end like the original Chanel handbag, almost no one, not even the original manufacturer 'Chanel' bags can tell you if you get a copy of the Chanel bag, as long as you get the right shop like your Chanel bag. Like the author, I grew up in an all-white town and was always made to feel dumb for being Asian. I like this book because it explores the complexities of being a person of color, having immigrant parents, and so forth. It doesn't try to "teach" things, but one comes away with a better understanding of racism and why it's so insidious. I at first wasn't interested in the book because it looked like a "kid's" book, but I think adults can enjoy it, too.